Name : Mr. Hawan Sutanto (January 31,2001) Jawa. Merasa bangga dengan diterimanya kehadiran kami di hotel Tamukami. Terima kasih juga atas semua pelayanan dan pengertian atas segala kemauan dari kami. Yang pasti servicenya memuaskan sekali. Moga lain waktu bisa kembali lagi ke hotel ini dan thanks a lot untuk mas yang di FO yang sangat - sangat ramah dalam melayani kami. A beautiful hotel delightful garden and pool setting. I this was our "treat" after staying in losmen - style accomodation. Your friendly staff made us feel very welcome. Thanks. For one week this was like in Paradise for use, the staff so friendly, the hotel so beautiful, to say this in one word : Great ! We would like to come again and enjoy everything here ! Thanks a lot. Great Hotel the cleanest, friendliest, Well come again Many thanks, Terima kasih Sampai jumpa. Name : Hoshino, Japan Thank you very much all staff !! we had been traveling Bali for 10 days. Hotel Tamukami is very nice !! Next year we will back here !! Name : Yuwa & Esme Hedrick-Wong (Jan. 2, 2001) Singapore. Its been a great pleasure staying at your very fine Hotel - a finely blance of quiet elegance, luxury and intimacy. We will be back, hopefully very soon. Dear Eugeen & Suzanne We were very lucky when we found Tamukami on the internet and it is so much better in real life. A true oasis in the heart of busy Sanur. We like the fact it is only 20 units surrounding the beautiful pool. We met wonderful people while here. The staff are reall sweet & friendly, the food delicious & the Balinese entertainment musical, The classical dancers were equisite. New year Eve was a'blast for Rachel. We'll be back as soon as we can. Thank you very much I had an excellent time. Hope to be back soon. I didn't know that it is such a nice hotel when I found it by internet. Room is very clean, nice balcony and nice pool and so on. I will stay here again when I visit to Bali for sure. Anyway thank you for everything !! We had a wonderful stay at this lovely hotel, we did enjoy at a lot. Your hotel is so beautiful and your staff is just great always helpful, friendly. Hopefully one day we'll back to enjoy this peaceful oasis. Thank you for excellent service We had a great time. Merci pour ce si' inoubliable, dans un cadre paradisiaque. Merci egalement a la gentillesse et au sourire du Personnel. Des Francais heerneux. You have my admisation, and I know how difficult it is to achieve what you have : A lovely, very personal hotel with staff who could not be more charming and helpful,. I have enjoyed my week with you very much and will certainly recommend "Tamukami" to my friends. Thanks for a wonderful time. We had a very nice time in Tamukami and are looking forward to coming back latter this year. "Hatur Nuhun kanggo pelayanan anu sae pisan " Terima kasih for the best time we had. Name : Karin & Ine ( Norway ) Jan. 8, 01. Thank you for a pleasant stay, only one night, but very nice and enjoyable ! The staff and atmosphere is just excellent. We would love to come back again ! Regards. This place is great ! The lovely clean rooms and a very comfortable bed made it a perfect place to stay - which we found you earlier. Thank you for a wonderful stay. Wonderful place to Stay !!! Great Staff took care on every need. We came for two weeks to Bali for first time. It has been real nice, people are nice and Bali is beautiful. Great place to spent Honeymoon. Dear Owner & Staff, We came here from Japan, as our " Honeymoon ". It will be precious memory to stay here in Tamukami. We enjoyed clear room and pool, also the staff treat us with good hospitality. I hope we will visit here again. Esthetique cook. I thought old is beautiful, but you are new and excelent. Terima kasih banyak-banyak. We have to say Tamukami is sincerely a great place to stay. Nice staff, nice pool, last but not least is your every detail attention to everything. I was so impressed that a staff of yours passed me a copy of instructions how to multiply a plant. Another thing is the food quality in your restaurant is also excellent. There is no way that the food in the other restaurants can be compared with yours in your hotel. We will definitely come back to Tamukami hotel again pretty soon. Dear Tamukami Hotel staffs. I found my-self living in a cosy little paradise, the setting is beautiful - the swimming pool, the trees & plants, the room , the reception and other facilities. The service is impecable. I believe it will change the travel pattern from now on for my-self & Linda. We will come back very soon. Dear Tamukami Hotel staff. Thank you for a delightful stay in a beautiful place. The hotel is wonderful and wonderfully maintained. Thank you for excellent service - always delivered with promtness and a smile. We have enjoyed our stay and will recommend Tamukami to our friends. The only bad thing is all the weight we're gained from eating the fabulous Indonesian food. Thank you once again for everything. Most enjoyable stay, my second visit. Food grand, staff delightful people. Name : Ryu Hirakawa ( Japan ) ( 31 Jan '01) Everytime I spend very comfortable time in TAMUKAMI. See you next month! Excellent hotel with the friendliest people in Bali. Will return soon to 2nd home. I was so happy to be here with John for a week of fun, relaxation & pleasure. Only stayed here for 2 nights but it was a pleasant stay with excellent service. Schone Urlaub im Bali. Schone Hotel Tamukami, ist alles schone alles prima. Grüsse von GERMANY. We had a lovely time in Bali in this Hotel. Wonderful people, wonderful service & a truly lovely hotel. Thank you so much to all for making it such a lovely time for us. Take care. Dear " all " at Tamukami ! As I told the receptiont : " we are sad today " !. We have been in Balli for 4 weeks now - and we are going home today. After having used the pool during our first days in Bali. we decided to " end " our holiday at Tamukami. We love your friendlyness and always smiling faces. May the sun and luck always smile back at you all. Thank you. Beste Suzanne en Eugeen Jullie hotel doet zijn naam zeker eer aan. Gastvrij een huiselijke sfeer, hartelijke ontvangst, vriendelijk personeel. Kortom, alle. Ingredienten zijn aanwezig om je hier thuis te voelen, ver van ons eigen huis. Tot ziens. I'm positively surpriced of this hotel. Everything is tidy and beautiful. The personnel polite and helpful. After these two days I'm looking forward to my next stay here. God bless you. Hari ini saya pulang ke Japan, hotel ini bagus ! Saya datang kesini pasti. Terima kasih. Thank you for such a friendly + hospitable service ! - My Stay was all too short - I shall return + bring others ! Beautiful hotel and very friendly. I'll be back. Banyak terima kasih I always enjoy the stay at Tamukami, feeling like at home. I know every time I come here, staffs have been better trained and, as a result, quality of services has been continnously improved. See you soon again. What can I say ? Great service amazing food and exceptional rooms make Tamukami a place that I will never forget and recommand too all my friends. Many thanks to all the staff. I hope to see you all again very soon ! Geachte heer Eugeen De Geest, Hierbij willen we U bedanken voor Uw aandeel in onze fantastiche Bali vakantie. Ik hoop dat het u nog kan herinneren, Wij hebben tot 3 keer toe in Uw retaurant gegeten met een groep van 6/8 personen. Maar helaas was voor ons de tijd voorbij en moesten we weer naar huis en de anderen bleven in Bali. Wij hebben zeer prettige herineringen aan Uw restaurant en kunnen nu zien op de video hoe bijzonder de sfeer is geweest. Dit alles is ook veroorzaakt door de muzikanten die zo'n speciale " Indonesian " sfeer wisten te creeren. Het was fantastisch. Mede namens mijn vrouw willen wij U en Uw vrouw Susan en Uw pleegkinderen en de leden van de muziek van : Keroncong Orchestra, Quartet Nusa Dua un Dua en Duo Batak heel hartelijk danken voor onze onvergetelijke Bali vakantie. Voorts moet ik U complimenteren met het bijzonder prachtige hotel en restaurant. Tot in de puntjes verzorgt, de open keuken, de prachtige toiletten. Zelfs Uw visitekaartje en folder " Meeting Point in Paradise " en uw Website zien er perfect uit. Wij hopen van ganser harte dat vele toeristen de weg naar Uw Paradise weten te vinden. Hartelijke Groeten, Marry en Piet van Arkel Jan van Henegouwenstraat 15 2405 ZP. Alphen aan den Rijn. 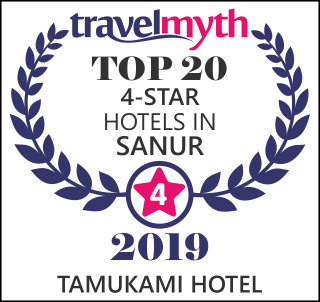 We have travelled right across Bali and have stayed in eight diffrent hotels, but by far the best is the Tamukami for it's excellent staff and service. Thank you for an excellent stay sorry we found it too late. Thank you. Slechts 2 dagen verbleven we in jullie hotel in Bali. Veel te kort om dit prachtige eiland te leren kennen. Toch hebben we vele, onvergetelijke momenten beleefd : - de aankomst op de luchthaven van Denpasar waar een 50, tal taxichauffeurs naambordjes in de lucht staken, waartussen we het onze moesten vinden. - het mooiste zwembad ter wereld ooit gezien. - de vriendelijke bediening door jullie personeel. - de prachtige Balinese dansers en zangers tijdens een gezellig dinner. - de indrukwekkende tempels en rijstvelden. - de vele Balinezen die samen met familie en vrienden hun " Kerstmis " vierden. Taala taas. Hyva paikka, niinkuin pari viikkoq sitten. We wish you success and hope we'll have an opportunity to come here some day for a longer time. 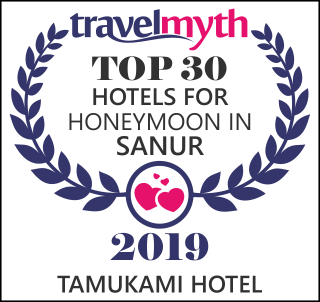 The highest compliment that can pay to the terrific management and service staff is to say that I changed my Flights twice to stay an additional week on Bali, and I thoroughly enjoyed the entire time here at Tamukami. The perfect base to see Bali from with a great welcome feeling ! A very relaxing environment, no wonder Meredith an Doug stayed so long in Tamukami. .. De kamers zijn zeer mooi en proper en de bedden zijn super goed ( als ons Ma & Pa niet zo hard hadden gesnurkt had ik zeker geslapen gelijk een engeltje! Het restaurant is geweldig ( vooral de satey ) Spijtig dat we moeten gaan. PS : Bedankt voor naar al m'n getater te luisteren ! Thank you for your hospitality in this " Paradise "
Apres avoir passé dix jours dans cet endroit magnifique qu'est Tamukami, ou le personnel nous a enchante par son sourire et sa gentillesse, nous partons de ce petit paradis plein de belles images dans la tete. Merci de nous avoir accueilli. Thank you for all, I had a wonderfull time in this nice Hotel ! The Gods were on our side when they sent us to " Tamukami ". It has been our home for 5 weeks and life could not have been better. The management + all the staff have been wonderful, ( The " A " Team ), a real family away from home. We will be back, you can be sure of that + we will be recommending Tamukami to all our friend + family. We look forward to our return in the very near future because we will miss you all so much not to mention the excellent food & service. Thank everyone & you for putting up with us + being such good friends. We Love you all. It was a wonderful week in your hotel. We enjoyed staying here very much. The staff is extremly nice and helpful. Thank you very much. We will come again. This hotel is very cute. I have many good relax. I hope I will come back again next time. Thank you very much. Very nice time as usual, because of staff & owner. Thanks Tamukami. Rudi, Christal, Joey Dit was onze eerste eer in het prachtige Bali, zeker voor herhaling vatbaar. Wij hebben rondgetrokken gedurende 20 dagen en zijn hier in Tamukami gestopt om onze laatste vakantiedagen door te brengen. Wat wij wensten is uitgekomen ; rust, comfort, bediening, etc. Alles was perfect in orde en we zullen dit hotel dan ook aanraden aan al onze collegas en vrienden. Hopelijk tot nogeens en bedankt. Oase van rust en luxe in een gastvrij land ! Wat wil je meer om de batterijen op te laden. Bedankt voor de gezellige sfeer en het warm onthaal. Tot weerziens. Wij zijn kontent voor de mooie dagen, de ontvangst, het eten was zeer goed, het hotel prachtig en de omgeving veel groen, we danken voor bij U te zijn geweest. The most beautiful end of our journey !. Thank you. We're sad to say our stay was too short. A delightful, peaceful place here that I'd love to return to. Thank you for the kind service.